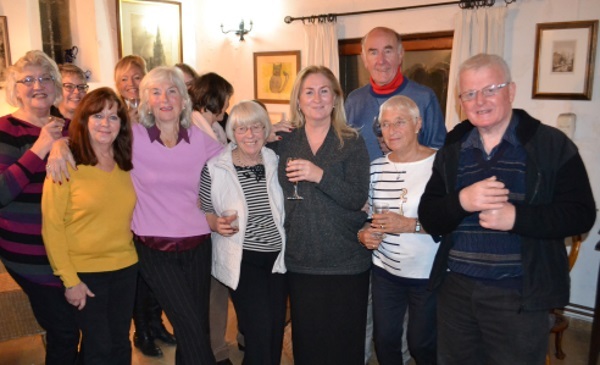 We were delighted to be invited by Rev’d Wendy Hough, the Chaplain of St Andrew’s Church, Kyrenia, to a get-together at the Hermitage on Friday 6th January. The Christmas period is obviously a very busy time for Rev’d Wendy and she felt that after the festivities it would be nice to get people together at a time when it suddenly goes very quiet, hence the invitation to The Hermitage for drinks and nibbles and a chance to meet up with friends and acquaintances old and new. Through the Christmas period many people were ill as a result of the virus which has swept through North Cyprus so the decision to hold the get-together after Christmas was a very good idea. We arrived to find a large number of people in the small lounge area of The Hermitage, all chatting away and enjoying the occasion. Because of the time we spend publicising news and articles on cyprusscene.com we are not often able to attend events but felt that we needed to have some quality time with people and were pleased to accept the invitation. As usual there were people we knew and some we did not so it was good to make some new acquaintances and we hope to meet up with some of the interesting people we spoke to and be able to publish some of their news and reviews in the future. It was an extremely nice evening and such a good idea in this rather uneventful time of the year to bring people together. Thank you Rev’d Wendy for your hospitality. This entry was posted in British friends, Events, Friends Pages and tagged North Cyprus, Revd Wendy Hough, St Andrews Church Kyrenia, The Hermitage Girne, TRNC. Bookmark the permalink.